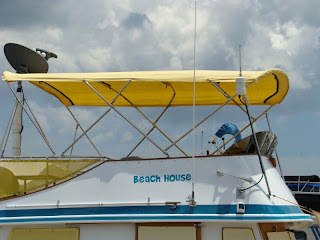 As many of our followers know, we built our own bimini back in June of 2009. The yellow Sunbrella has kind of been a trademark for Beach House wherever we go. But the Florida sunshine and the cold damp weather in the Chesapeake has taken a toll in just a few short years. We usually get at least five years out of a bimini, but not this time. Weighing the pros and cons of building another fabric bimini or finding an alternative has suddenly come to the top of the to-do list. This is another of those unexpected repairs that we thought we would deal with in another couple of years. But it is a boat after all.